What pops into your head when you think of branding? A logo? A company name? Maybe even a tagline? Every business needs a name and a logo. It’s one of the first tasks you turn to as you start up. Most people think that a logo and a name equal the brand. But a brand is a lot more than just a logo. It is one of the most important components of any business. And it can be extremely valuable. The Apple brand is currently the most valuable brand, estimated to be $154 B. But do we buy iPhones because we like the apple logo? No, we buy it because the brand promises quality and performance. And because we believe they “Think different”. So let’s dig deep and figure out what we can learn from successful brands and see how we can apply it to a startup. To understand business terms I often find it useful to look for their origin. Historically a brand was a mark that was burnt onto livestock to identify the owner of the animal. A few hundred years later jewellery makers branded their creations with hallmarks. Today anyone who creates a product and wants to be known for its quality is using branding. Leaving an indelible mark is still the most important part of the brand. A brand is not a brand unless it leaves a lasting impression. But leaving a visual sign of identification on an animal or product is only part of the story. Think of any brand that is instantly recognisable today and you will realise that what we care about is not the logo on the box. We care about what is in the box. Good brands stand for quality and uniqueness. When a product is presented alongside other similar products, it is the one perceived to be the better one that gets chosen by the customer. Branding is what creates this perception. The visual component is the tip of the iceberg. But like in any iceberg the bulk is hidden. What lies beneath the surface of a brand are the emotional and meaningful sides. This is not to say that the visual part is not important; it is. Logo, fonts and colours make the brand instantly recognisable. But it is not why we fall in love with a brand or why we choose to buy certain products repeatedly. The emotional part of a brand tickles our senses beyond the tangibles like colours. The tools that are used to convey emotions include images and filters. It also includes a term that can be difficult to pinpoint: the voice. The voice is the way a brand communicates in words. It can be humorous, or authoritative. It can be short and to the point or poetic. Whichever style is used, it verbally reflects the brand and should speak to the customer. Just like in everyday conversations, it's the tone that makes the music. How something is said is often more important than the information that is conveyed. A picture speaks 1000 words. This FatFace image (from facebook) conveys relaxed, uncomplicated and durable comfort. Last but not least, we come to what is arguably the most important part of any brand, the meaningful part. This is what connects a brand to its customers. It is the story of the company, the why-do-we-exist. It is the part that builds relationships. Indeed the need for people to belong is also the major driving force in social media. People share what they stand for. And they share the things that better show other people what they want to be known for. People frequently associate with brands as a shortcut to explaining themselves. When you start a business and you realise the importance of a logo and a branded website you will think that getting professional help is the best solution to getting set up well. It makes sense. Professionals are trained at that specific art. But here is the problem. Professionals have a blinkered view of what you actually require. The logo or web designer will talk to you from a visual perspective. But as we saw earlier the visual part is only one aspect of your brand. In addition to that, there is another problem with designers. They often look for a design brief from you, which explains who you are, what you do, and how you differentiate yourself from the competition. If you haven’t got one, they will create one with you. They will understand the importance of creating the right feel for your brand. They will ask the right questions. Sounds great. But here is the pun. You may think you know. We all have a vision of how our product will make the world a better place. But the reality is that you may not have all the knowledge available. You may not have many or any customers to ask for feedback. The answers that you require are the ones that tease out the tiny but significant distinction that the market is looking for. It is not what makes you different from your competitors, but what you can bring to your customer’s lives, that is meaningful. And you may not know what that is yet. The answers that you could offer a professional designer are most likely to be best guesses in the absence of certainty. So whilst you are in this position and you cannot offer a designer certain facts, you may want to consider a different option. You need an option that allows two things: flexibility to tease out the magic difference that people are willing to pay for. And consistency because your potential customer needs to recognise you in a world full of logos, messages and advertisement. Spending significant sums of money on a designer may be undesirable in two ways. Firstly you spend money that would be better spent elsewhere. Secondly, you will be reluctant to throw out a professionally designed logo or website when you discover that your initial branding no longer reflects what you want to be known for. You may no longer follow your instincts because your professionally designed brand has put you into a cage that tells you who you ought to be. You need flexibility which allows you to adapt to a changing business world. Branding is not a startup exercise. You need to consider branding for the lifetime of your business. At regular intervals, you need to review, tweak and evolve your brand, or risk being left behind. If you learn how to do this at the beginning of your startup you can use it again whenever required. To begin with, you need to consider things that you know for certain and separate that from the things you don’t know yet. Detach what you want to keep consistent from things you want to experiment with. Features you can be certain about are your own personal attributes and values. I would suggest you start there. Your own values matter. 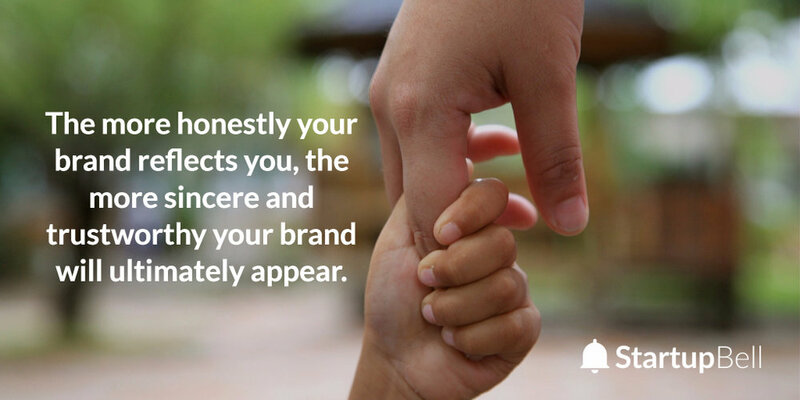 The more honestly your brand reflects you, the more sincere and trustworthy your brand will ultimately appear. Concentrating on our values creates clarity and consistency because our values are set. We do not change them throughout our lifetime. We don’t even have to think about them; our values already form part of our identity as a person. We only need to think about how to use them to reflect our brand. We need people to perceive us the way we want to be known. There is a difference between brand identity and brand image. Brand identity is the sum of attributes we want to radiate from our brand. The brand image is how others actually perceive our brand. We don’t trust people that say one thing and do another. And we don’t trust and associate with brands that have a clash between identity and image. We have developed highly sensitive radars to separate the brands that have our best interest at heart from those that just want our money. Inconsistencies alert us because they appear dishonest. So if you want to create a brand from scratch start with the details that are certain not to change and inject these into your brand’s look and personality.